Earn 3.75 Creds Per $ Spent at Peter Alexander ? 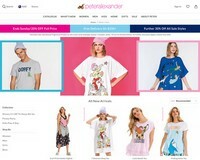 Get this deal now at Peter Alexander Or Join for free to earn eligible Creds! Gone in a blink 20% Off new arrivals & full price ends tomorrow! Can't get enough of Peter? Shop the range of new arrivals for the latest and greatest in women's, men's and kids' PJs. Printed pyjamas, PJ sets, boxer shorts, loose sweaters or slinky nighties… whatever your bedroom style, there's something fresh and new for you at Peter Alexander.